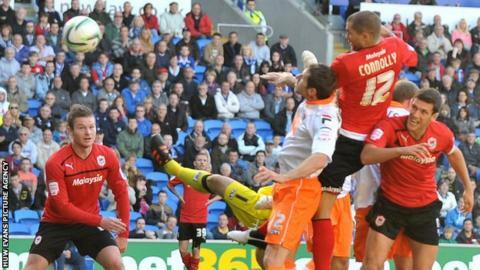 Matthew Connolly scored twice as Cardiff maintained their 100% home record with victory over Blackpool. Connolly opened his account on 17 minutes with an accomplished finish before Peter Whittingham doubled the lead with a stunning free-kick. Cardiff extended their lead 11 minutes after the interval through a Connolly header following a corner. Matt Phillips hit the post late on but Blackpool were poor. The win moves Cardiff up to second in the Championship but Blackpool have now won just one of their last five matches. Blackpool included only four players who had started in Monday's 3-1 defeat to Huddersfield and Kirk Broadfoot was handed his debut. Malky Mackay opted to make only one change to Cardiff's side, with Craig Noone replacing Don Cowie in midfield. Cardiff paid tribute to their former manager Jimmy Andrews prior to kick-off with a minute's applause. Both sides showed a willingness to attack early on with Craig Bellamy's effort gathered comfortably by Matt Gilks, while, for the visitors, Matt Phillips tried his luck with a long-range effort. It was the home side who broke the deadlock when Connolly met a Bellamy cross to fire the ball into the back of the net from close range. And Cardiff doubled their lead 10 minutes later when Whittingham fired home a stunning free-kick from the edge of the area. Veteran Kevin Phillips had the chance to reduce the deficit five minutes later but his effort from close range cleared the crossbar. The impressive Whittingham continued to cause problems and, as the half drew to a close, he played in Bellamy, whose effort was saved well by Gilks. Having failed to add to their tally in the first half, Cardiff did not have to wait long after the restart for a third goal. Connolly, having earlier scored his first Cardiff goal, doubled their lead with a header from a Bellamy corner. Blackpool manager Ian Holloway made changes in a bid to galvanise his side but the visitors did little to trouble Cardiff. Bellamy fired over the crossbar while Matt Phillips hit the post for the visitors in the 74th minute. Stephen Crainey's free-kick hit the crossbar in injury time to complete a disappointing and frustrating afternoon for the Seasiders. Cardiff manager Malkay Mackay: "That was our best performance of the season when you consider the team we were up against. "They are most people's favourites to win the league with the squad they have but we scored three goals, created a lot of chances and kept a clean sheet. "It was great to get our fourth home win. The stadium is rocking with the fans right behind us and we're looking a real goal threat from all areas of the pitch." Blackpool manager Ian Holloway: "In the last two games we have passed and moved and Cardiff's crowd were on top of their team at the start, but goals change games and that's what Cardiff did. "The goals we conceded weren't good enough from our point of view. Cardiff played well but they won't score easier goals in their lives than those they got against us. "We had a spell like this last season so we just have to put our heads down and get through it."